Where have all the artists gone? Or, more to the point, why do so many seem to be keeping quiet? One of the most distressing features of today’s political climate is the scarcity of diverse voices; it appears that many artists have surrendered to the perceived futility of speaking analytically about the current state of affairs in the world. Critically lauded folksinger and activist Ani DiFranco is one of the few prominent performers who has produced an artistic commentary in direct response to the events surrounding 9/11. 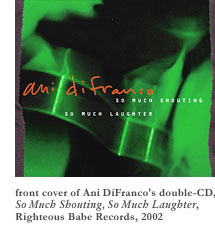 DiFranco’s song-poem, “Self Evident,” was inspired by her desire to present “alternative voices beyond the TV propaganda and the deflating messages from the powers that be.” The song, which appears on her latest live album, So Much Shouting, So Much Laughter, weds an intensely sympathetic description of the tragedy of that day with a rhythmic diatribe on the increased elements of commercialism, militarism, and racial and religious intolerance that she believes marked the aftermath. DiFranco, a native New Yorker, presents the trauma as a communal experience that all suffered: “We were all on time for work that day / we all boarded that plane for to fly / and then while the fires were raging / we all climbed up on the windowsill / and then we all held hands / and jumped into the sky.” The song is a smart and compassionate reflection on multiple lossesDiFranco dwells not just on the loss of lives, but also on the disappearance of simpler ways of existence that seem symptomatic of our timesthat shifts between catchy rhymes and phrasing and meditative lyrical passages. DiFranco’s multivalent, raging sorrow comes through clearly. It’s refreshing to hear an honest response to the subject that avoids jingoism and sentimentality without sacrificing passion. 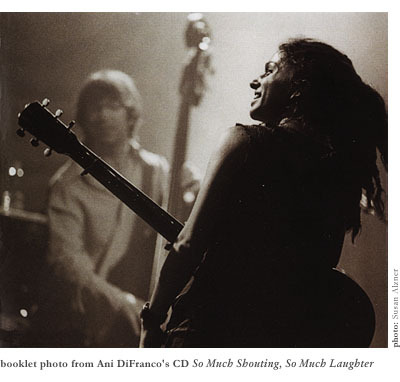 During the past year, “Self Evident” has become a staple of DiFranco’s performances. It was the last song in the set at her energetic tour stop at Boston’s Avalon Ballroom, and it left the audience sober and wanting more. DiFranco was in top form. Although forced to sit because of a foot injury, she was wisecracking, energetic, and passionate, and her fans responded with approval. Still, even her biggest devotees seemed unable or unwilling to fully embrace her message. DiFranco’s considerable gifts as a lyricist notwithstanding, her soapboxing is often hindered by a tendency to overload on issues. (“Self Evident” offers up its two cents about the environment, abortion, El Salvador, the treatment of Native Americans, and the prison system, among other hot-button topics.) In some cases, the intensity of her candor sometimes becomes so top-heavy that it swings into self-parody. Inevitably, DiFranco’s more self-reflective periods lead to better songwriting. Her recent divorce has inspired many luminous new songs raw with the disappointment of lost love. In “Grey,” one of these more personal compositions, DiFranco breathlessly criticizes her own inability to find happiness: “You walk through my walls like a ghost on TV / you penetrate me / my little pink heart / is on its little brown raft / floating out to sea / and what can I say / but I’m wired this way / and you’re wired to me / and what can I do / but wallow in you unintentionally? / yeah, what kind of paradise am I looking for? / I’ve got everything I want, and still I want more.” Her ability to laugh at herself, and her willingness to explore her own demons and expose her mistakes, is another hallmark of her work and a testament to her honesty as an artist. But both as a composer and a performer, Ani DiFranco has been faltering in the last few years. To my mind, she hasn’t had a really stellar and cohesive CD since Little Plastic Castle, five albums and over five years ago. The problem isn’t, as many fans have thought, that she’s moved away from a simplistic, lean folk sound. (Her earlier music was characterized by the simple richness of a single voice and a lone guitar, a sound that some have undoubtedly fetishized.) One of the best songs of her career is still her live rendition of the balladic “Both Hands,” rendered lush and stratospheric by the addition of full orchestral accompaniment. It’s been her move towards funk and experimental beats, not towards increased instrumentation per se, that has been her real downfall. Songs that once were luminous are too often spat out rapid-fire or impersonally jazzed up; under such pressure, they lose their emotional resonance and turn harsh. So Much Shouting, So Much Laughter includes a few gems (the aforementioned “Self Evident,” “You Had Time,” “Gratitude”), but it tends towards dissonance and a kind of cool impermeability. Ironically, DiFranco’s politics have also begun to be more problematic in recent years. It’s not that she’s become more strident or left-wing, or that her message lacks relevanceit’s that, more often than not, she’s begun sacrificing melody for meaning. Her songs have taken on a repetitious, scattered tone at a time when she should be becoming more innovative and focused. Sadly, producing inferior music (even if it’s better than most other recordings out there) doesn’t win fans or help to spread an ideology. Still, there seems hope. DiFranco has been talking about taking a break from touring and spending more time writing and composing before she releases her next album of new material. Perhaps, with more time devoted to reflection and creation, she’ll find a fresh direction. And, even though it isn’t a complete success, “Self Evident” does mark a leap both in DiFranco’s musicality and activist mentality. It’s good enough and provocative enough that it stands a chance of touching people of varying political persuasions. Ani DiFranco is not entirely alone; other artists have responded visibly to current global events. Editorial cartoonist Ted Rall, in his latest graphic novel, To Afghanistan and Back, deals specifically with the events in Afghanistan. Rall spent several months traveling there, and his booka thought-provoking, alternately disturbing and blisteringly funny combination of cartoons, news, and travel writingprovides a realistic window into the Afghan people and the difficult conditions of their lives. Another artistic statement has come in the form of the double-disc benefit compilation Peace Not War, which features songs from a diverse group of musicians (including DiFranco, Public Enemy, Billy Bragg, and Massive Attack). Perhaps the biggest artistic declaration so far has come from the signers of Not in Our Name, a strongly pro-human-rights statement that has appeared as a paid advertisement in the New York Times and other major papers. Among the signers are such liberal standbys as Jane Fonda, Noam Chomsky, and Pete Seeger, but there are also some interesting surprises: Daniel Handler (a.k.a. Lemony Snicket of children’s book fame), John and Joan Cusack, and Kevin Smith, among others. The artistic community, slowly but surely, seems to be rousing itself to action. No matter one’s beliefs, it does us all a disservice when people are hesitant to express themselves. Perhaps when more artists follow the lead of those like Ani DiFranco and actively critique current events, citizens will begin to realize that a population does not and will never speak with a single voice. Perhaps they, too, will gain the courage to explore important issues without fear of embarrassment. It is hoped that, as a result, there would be increased dialogue and, perhaps, new solutions to problems. Of course, we could also get some great new art in the bargain. Surely, as DiFranco’s masterful musical bravado has proved, it’s worth the risk.